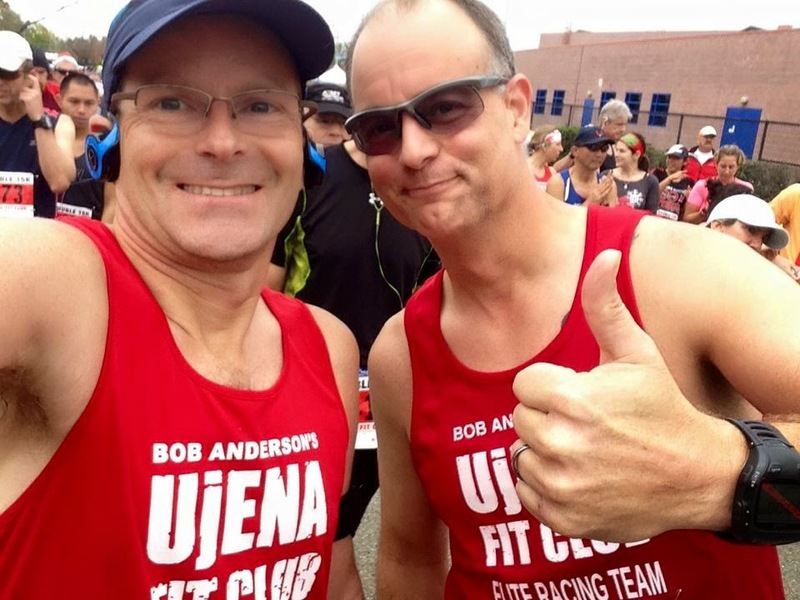 I had joined Bob Anderson's, co-founder of Runners World Magazine, UjENA Fit Club some time ago but never ran a 'Double' because of race conflicts. That is until I signed my 13 year-old son and I up for the Pleasanton Double December 21, 2014 for some father/son bonding! Group shot with Bob after race. Bob doesn't even look tired! I knew my son was pretty fast but lothed running because 'that is what dad does'. Luckily Bob has a 'kids' double that is just a mile, rest then half mile. That was the trick cuz my youngest has to run a mile at school anyway so no additional training needed! Trail running is my love but I like to throw in some speed road miles every once and awhile to remind my legs that they can move quickly. I started running locally around the neighborhood and added tempo runs (1 mile warm up, 4 miles race pace, then 1 mile cool down) to prepare. Here is how it went down on race day. OK you ask, "What's a Double"? It is very easy to go all out on the first race and bonk on the second. It is also easy to cramp up between races if you don't carefully recover. So, what was my goals and results? My goal was a 7:30 min/mile pace for both the 10K then 5K and I came close. My Garmin in fact was nearly spot on but chip time came in slower. I felt very strong on the 10k and probably could have raced faster. My heart rate averaged 170 and breathing was even. Felt great! For the half-time, I ate a recovery bar, drank several cups of electrolyte and spun on a stationary bike. Took a few photos with people, then lined up for the 5K. The 5k was a totally different race. Mentally you are thinking "Easy just around the course once instead of twice. Easy peasy". Not. I had to push hard to try and maintain what was once an easy 7:30 pace. Here are my 5K splits. Had nice strong finishes in both cases, but really slowed down in the middle. I had my Garmin 310xt and was monitoring my pace but my cadence would just drop off and it took my full attention to keep turn over high like its supposed to for a sprint. Average HR was also 170 but towards the end of the 5K I was panting and legs started to feel heavy. 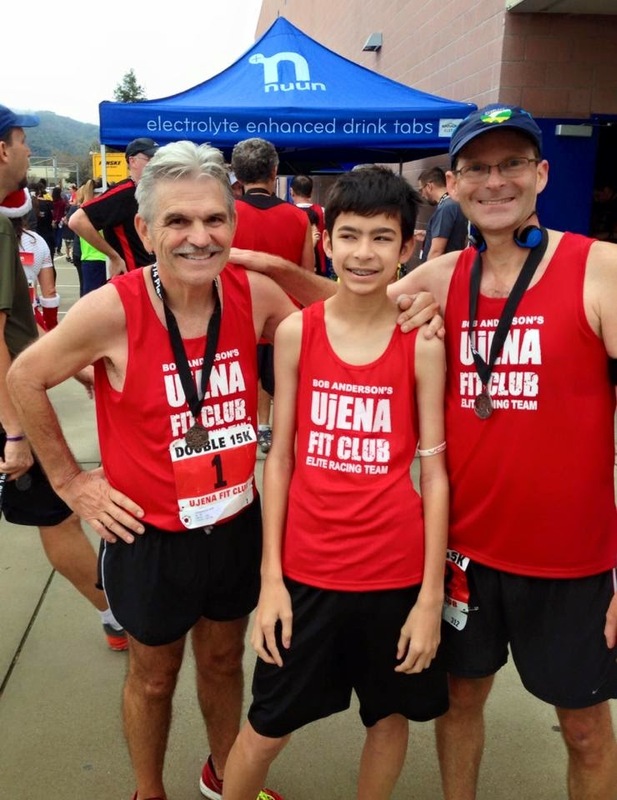 My son had a great race and averaged 6:15 min/mile, was fifth overall and 2nd in his age group. He wasn't even breathing hard at the finish. Wouldn't it be nice to be 13 years old and light as a feather again? I would definitely run a Double again. In fact, the weather was perfect in Pleasanton for a sprint and will sign up in 2015 for another! 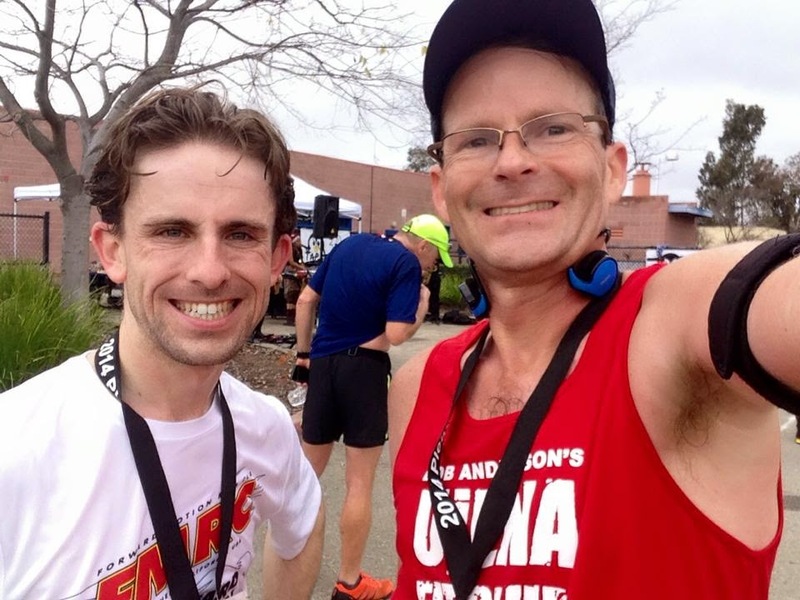 Pic with fell team member, John, who I tried to pace with. 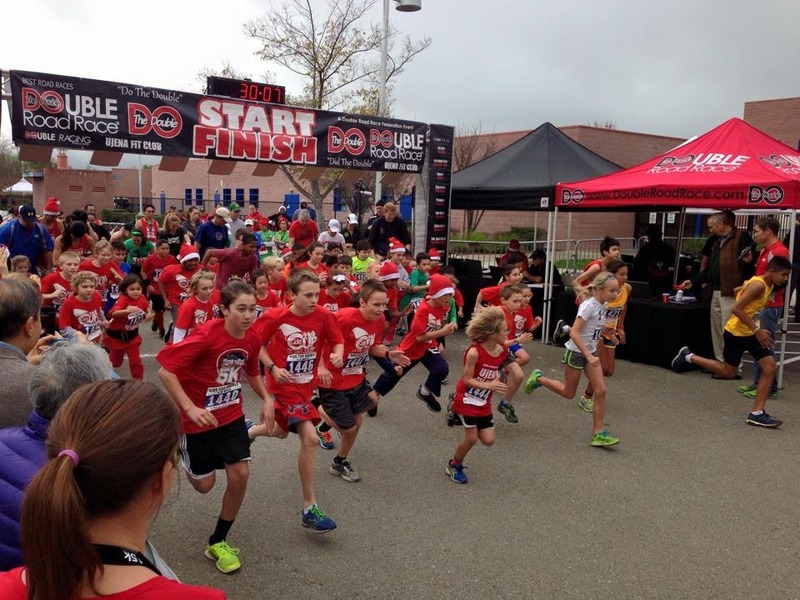 Kids 1 mile start. Son is upper right and they were on fire!